After a tough loss we have to consider the prospect of learning more simply to enjoy the game of college football, but it is especially important when you lose a game. In my case, I wish to offer youth and high school football coaches around the nation a peek at Oregon’s playbook, which is large, yet the Ducks do not use much of it in any one game. 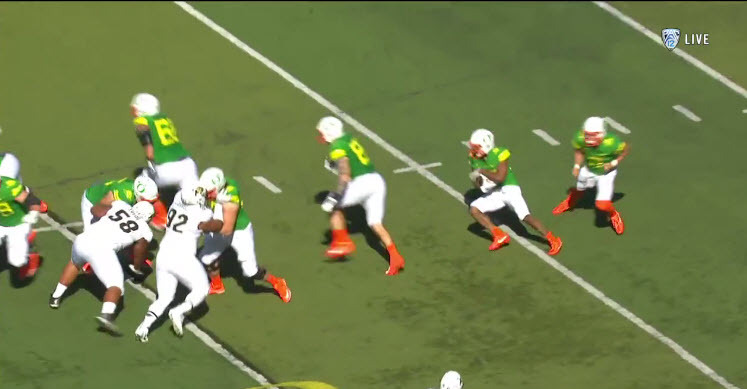 Oregon went years without running a Counter Play, and I could not understand why; it finally surfaced briefly in a game three years ago, and my analysis explained how it worked. It was great to see the play again against Colorado, but it was the surprise element that really sprung the play – along with superb blocking, of course. In keeping with our new tradition at FishDuck.com, we will examine a second example of the play in which it did not go as well. I will offer my thoughts as to why, but I welcome the input from coaches among our readership, as well. I apologize for the play recording (above) beginning long after the snap, but that is the incompetent Pac-12 Network video editors who are showing people on the sideline instead of the beginning of the play. I began it at the instant they began to show the play. They did have a good replay, so let’s break that down instead. 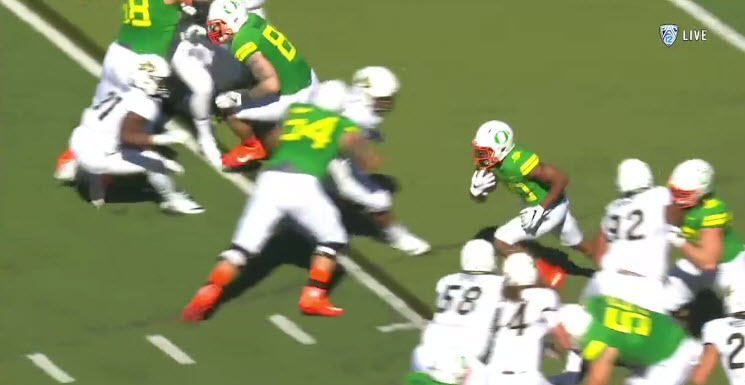 At the beginning of the play (above), we see two running backs next to the quarterback. 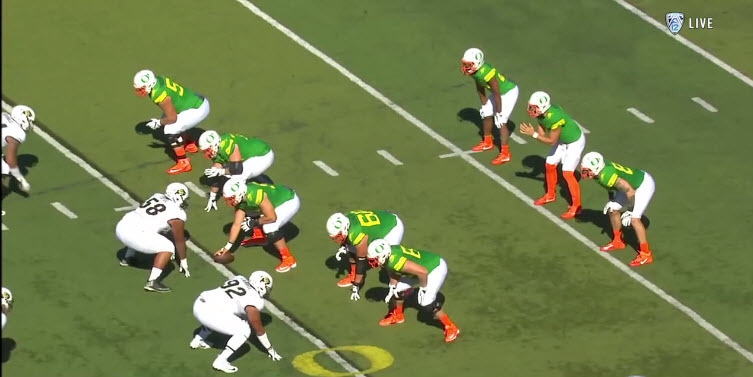 The Ducks often begin a Straddled Triple Option from this formation, which would have been my guess in advance. However, notice the wide splits between the offensive linemen for Oregon; this creates bigger gaps, hence larger holes for the running backs to run between the tackles. Two things going at once! We have a lot going on here as Tony Brooks-James, No. 20 (above), appears to be taking a hand off from Dakota Prukop (far right), for an Outside Zone Read going to their left. Meanwhile, we see Shane Lemieux, No. 68, pulling with Brady Aiello (lineman on the bottom) sealing the gap Shane vacated. We see Jake Hanson taking on the big Colorado nose tackle (No. 58) and getting an angle on him. Note how one of the running backs is headed to the side of the pulling guard; that RB is none other than tight end Evan Baylis, No. 81, who is operating as a lead blocker, or fullback, if you will. Suddenly (above), we see Tony plant a foot and pivot back the other direction following his blockers. This action actually resembled a play I saw against UC-Davis that I had not recognized yet and could use some help doing so. That other play was a QB Power going right, and an Outside Zone Read play going left at the same time. When the pulling is going to the same side as the Outside Zone Read … then it becomes the Inverted Veer I covered earlier, but that aforementioned unique combination is not something I’ve yet to identify (please email me at charles@fishduck.com or comment below if you know). This Counter play (above) runs counter to that play, and messes up the defensive keys the ‘Buffs must have set up in scouting the Ducks. Calvin Throckmorton, No. 54 (above), does a superb job to open a huge hole that Brooks-James dashes through; those redshirt freshmen can really run-block well, which says a ton about coach Steve Greatwood, the National Offensive Line Coach of the Year in 2008. That is a sweet looking play that was blocked just wonderfully (above). The Counter Play (above) was run later and this time it was Duck OL Cam Hunt, No. 78, pulling who just did an incredible job. In fact, the play was busted were it not for his continued work in sustaining his block for a long time. I am curious as to what the coaching community viewing this thinks of the play; why did it get so busted? 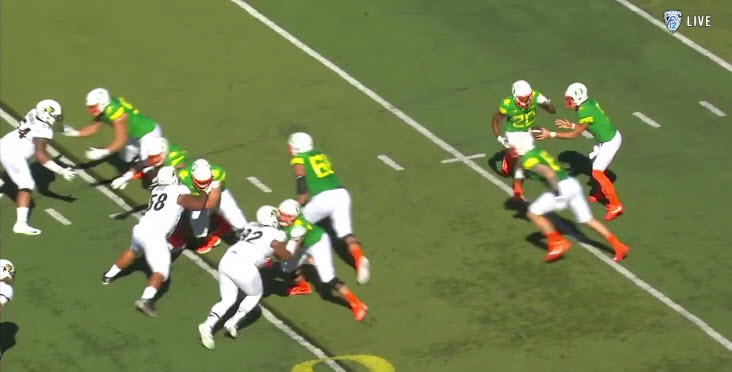 My theory is that I believe the running back needs to take another step or two in the direction of the Outside Zone Read Oregon is trying to imitate. I think he needs to sell it better going to the right before planting and going back left. Thoughts? Our Oregon Playbook is growing, and when we introduce the entire directory of more than 240 analysis articles and videos, you will love learning from it as I have. 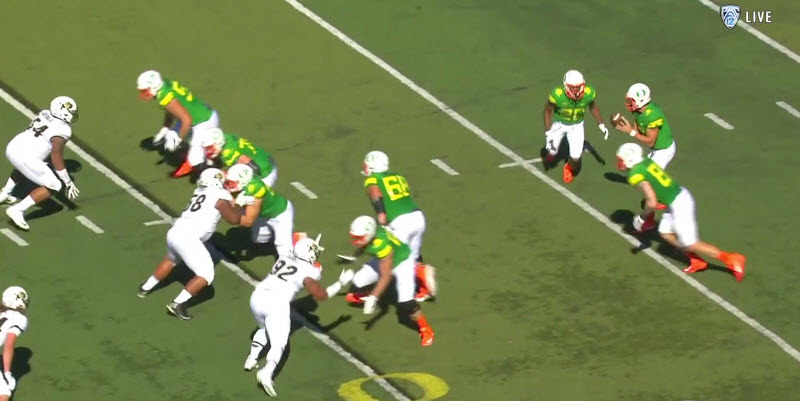 This is a nice addition … the Oregon Counter Play!